If I am to describe myself as an investor now, I will probably be an index investor. It has since been about 9 months ago that I subscribed to Invest-Saver. There were a couple of reasons that got me started. 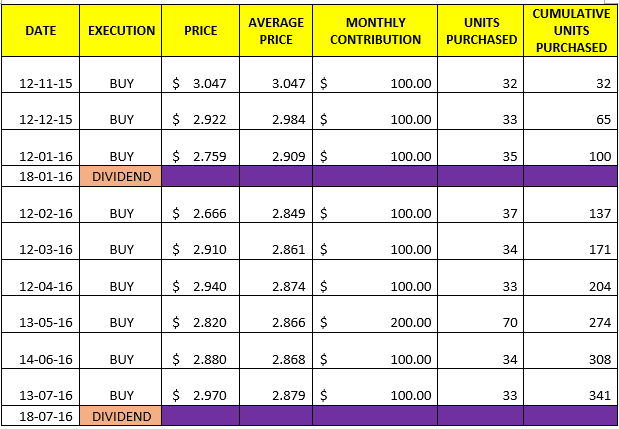 Firstly, I wanted to get started with stocks, secondly, learn about investing with a small capital and lastly, to discipline myself financially. 9 months on, how did it fare? $100 goes into the RSP monthly, except for June's amount of $200. 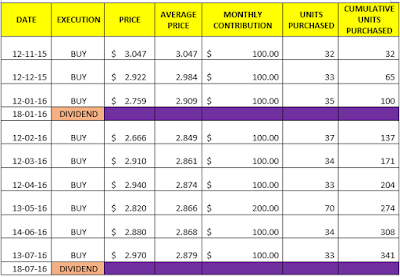 There were dividends of $2.93 in January and $10.59 in July. 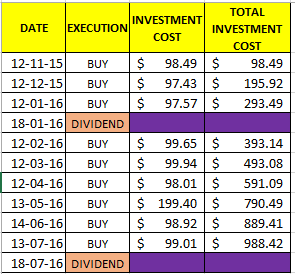 Total Return is $17.64 as of 29/7/16 which includes the dividends minus the commission costs. (Note that a few months back, the STI was really volatile and Total Return was negative, so it isn't all rosy always). Current share price stands at 2.93 as of 29/7/16). I am going to continue this plan until my ORD because that's when my cash flow stops. There was no particular reason for putting in $200 in June other than trying out the ATM function. There will always be different expectations of returns. A fellow army mate shared how he can win hundreds in a casino, another won hundreds in the recent World Cup. So when this topic came up, it's quite apparent that the returns are low and volatile for this Invest-Saver. But one of them signed up after he realized that time and the value of compounding could help here. To each his own. So I tell myself that in time, this RSP will shine even with corrections in the STI. I must be able to wait out those falls and be in for the long haul. Think ahead and try to see what ways can you continue making money after you Ord. Freelance or part-time work maybe? Don't stop the monthly rsp if you can! I will likely head for full-time work straight after. So I can continue again. I think I'm buying into life-long learning, haha. 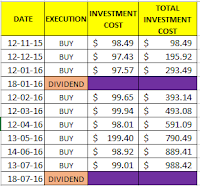 You've gotten $97.43 for your investment cost, was the workings the same as yours? Hi, do you mind sharing the spreadsheet you are using ?